CHICAGO – The Made-in-Chicago film “Signature Move” will have a Midwest festival premiere through a “first Tuesday” showcase at the Midwest Independent Film Festival on October 3rd, 2017, and it will take place at a different location, the Music Box Theatre in Chicago (usually the Festival is at the Landmark Century Centre Cinema). Lead Actor Fawzia Mizra, director Jennifer Reeder and other cast/crew members are all scheduled to attend. 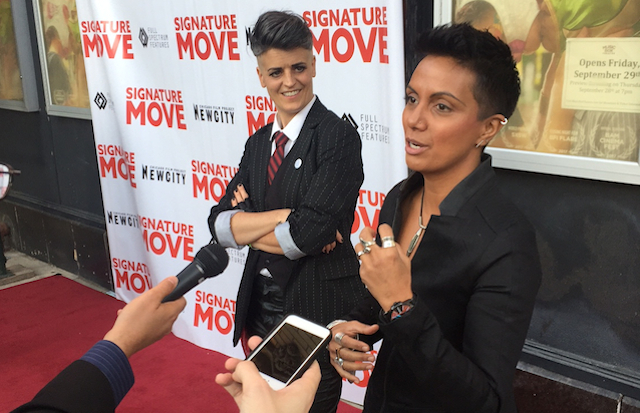 Shot entirely in Chicago, the romantic comedy “Signature Move” was written by Fawzia Mirza and Lisa Donato. The film features women wrestlers and lovers, a play on the common theme of the “signature move.” Mizra portrays Zaynab, an immigration lawyer whose mother (Shabana Azmi) is pressuring her to marry. But it’s not a man that Zaynab desires, it’s a Mexican chica named Alma (Sari Sanchez). And what is the Mexican angle without the masked wrestling matches? The film is funny, warm and showcases a passionate gay coupling. The Midwest Independent Film Festival is a year-round movie event in Chicago that takes place the first Tuesday of every month, at the Landmark Century Centre Cinema. The festival has been recognized by Chicago Magazine in their “Best of Chicago” issue, and has become one of the top places for local filmmakers, producers and actors to network in the city. From a Red Carpet event at the Music Box Theatre on Friday, September 29th, actors Fawzia Mizra and Sari Sanchez, who portray the wrestler lovers in “Signature Move,” talk about the making of the film and the story settings, followed by insight by director Jennifer Reeder. The Midwest Independent Film Festival presents “Signature Move” on Tuesday, October 4th, 2017, at the Music Box Theatre, 3733 North Southport in Chicago. The cast, director and crew of “Signature Move” will make appearances on behalf of the film. For all the night’s events, and to purchase tickets, click here. “Signature Move” runs at the Music Box Theatre through October 5th.